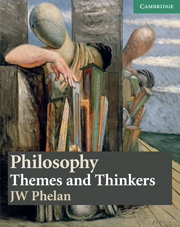 Philosophy: Themes and Thinkers covers key philosophical concepts, themes, and philosophy texts. As well as gaining a thorough grounding in these areas, students will develop the ability to analyse and assess philosophical writings, form their own judgements and contribute effectively to the process of debate. Features - learning objectives at the start of each chapter - profile of notable philosophers - stimulating activities throughout - revision questions - definitions of key terms in the margin. Review questions to test knowledge and understanding. End-of-chapter revision and discussion questions.